Dhaka, 25 Nov, Abnews: The cremated remains of what an inscription says is the Buddha, also called Siddhārtha Gautama, have been discovered in a box in Jingchuan County, China, along with more than 260 Buddhist statues. The translated inscription on the box reads: "The monks Yunjiang and Zhiming of the Lotus School, who belonged to the Mañjuśrī Temple of the Longxing Monastery in Jingzhou Prefecture, gathered more than 2,000 pieces of śarīra [cremated remains of the Buddha], as well as the Buddha's teeth and bones, and buried them in the Mañjuśrī Hall of this temple," on June 22, 1013. At the site where the statues and Buddha remains were buried, archaeologists also found the remains of a structure that could be from the Mañjuśrī Hall. Yunjiang and Zhiming spent more than 20 years gathering the remains of the Buddha, who is also sometimes referred to as Gautama Buddha, the inscription notes. "In order to promote Buddhism, they wanted to collect śarīra [Buddhist relics]. To reach this goal, both of them practiced the instruction of Buddhism during every moment of their lives for more than 20 years," the inscription says. "Sometimes they received the śarīra from others' donations; sometimes they found them by chance; sometimes they bought them from other places; and sometimes others gave them the śarīra to demonstrate their wholeheartedness." The inscription does not mention the 260 Buddhist statues that were found buried near the remains of the Buddha. The archaeologists aren't sure whether or not the statues were buried at the same time as the cremated remains, wrote the team of archaeologists, who were led by Hong Wu, a research fellow at the Gansu Provincial Institute of Cultural Relics and Archaeology, in two articles published recently in the journal Chinese Cultural Relics. The archaeologists did not speculate on whether any of the remains are actually from the Buddha who died around 2,500 years ago. 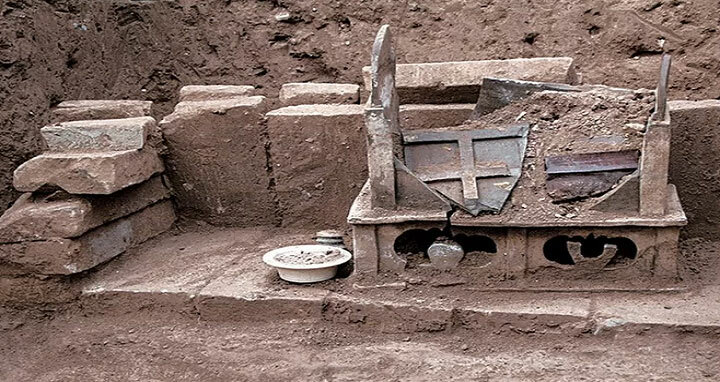 Previous archaeological discoveries in China have also revealed human remains with inscriptions that claim that they belong to the Buddha the archaeologists noted. These include a skull bone, supposedly from the Buddha, found inside a gold chest in Nanjing. The statues, which are up to 6.6 feet (2 meters) high, were created between the time of the northern Wei dynasty (A.D. 386 to 534) and the Song dynasty (A.D. 960 to 1279), the archaeologists wrote. During that time, Jingchuan County was a transportation hub on the eastern end of the Silk Road, archaeologists said. The statues include depictions of the Buddha, bodhisattvas (those who seek enlightenment), arhats (those who have found enlightenment) and deities, known as heavenly kings. Some of the statues only depict the head of the individual, while others are life-size, with some even showing individuals standing on platforms. A few of the statues are steles, which are stone slabs that have a carving within them. Steles are sometimes considered to be a form of statue. Few of the statues have any writing on them. One holds the date corresponding to May 26, 571, with inscriptions that mention a "disciple Bi Sengqing," who may or may not have created the statue. "[I] realized that I am confused (…) everyday, because of my admiration of the wisdom of the Buddha, [I] contribute my daily expenses as a tribute, to sculpt a statue of Śākyamuni Buddha, praying for greater longevity, and … reads the inscription, whose next line is not visible.